Saturday: Taxi at 5am. Always stressful as everyone has set alarm for 4:30, knowing it will take half an hour to get ready. Lots of tension over bathroom space. Except for Mario. He had decided it wasn’t worth going to bed. Husband gave him a 3am deadline for being packed ( visions of him falling asleep, not packed, at 3:30.) I just love the whole ‘male territory’ thing. We flew with British Airways. R had the window seat. Landed in Malta. Hired car through Avis, a Mazda 6. A very battered Mazda 6. As we left the airport, understood why it was battered. No one stops at junctions, you just have to try hard to avoid them. Arrived at Meridien Hotel. Nice lobby. Had drinks while they prepared our rooms and looked at views, which are brilliant, across a bay to a church. 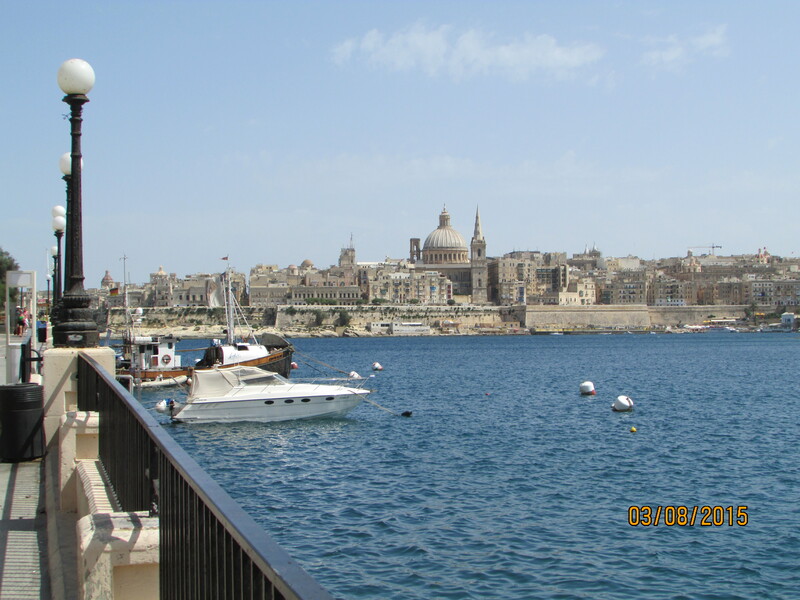 Walked around town and bought water ( water in Malta tastes horrid, though is safe to use for ice, washing salads, cleaning teeth, unless you are particularly sensitive.) Even at 6:30 pm, it was really hot, sweaty within minutes. Ate in Villa Restaurant, which is part of the hotel. Meals around €30 per head for starter and mains. Very nice. We sat on a veranda overlooking water, tiny lights in trees, beautiful. R told me that next to the sea you don’t get mosquitos so wont be bitten. This is not true. Sunday: Breakfast. Amazing buffet, had pretty much everything. Need to lose weight before nephew’s wedding or will need bigger dress – was not a good start. Family sat and chatted to each other on fb. 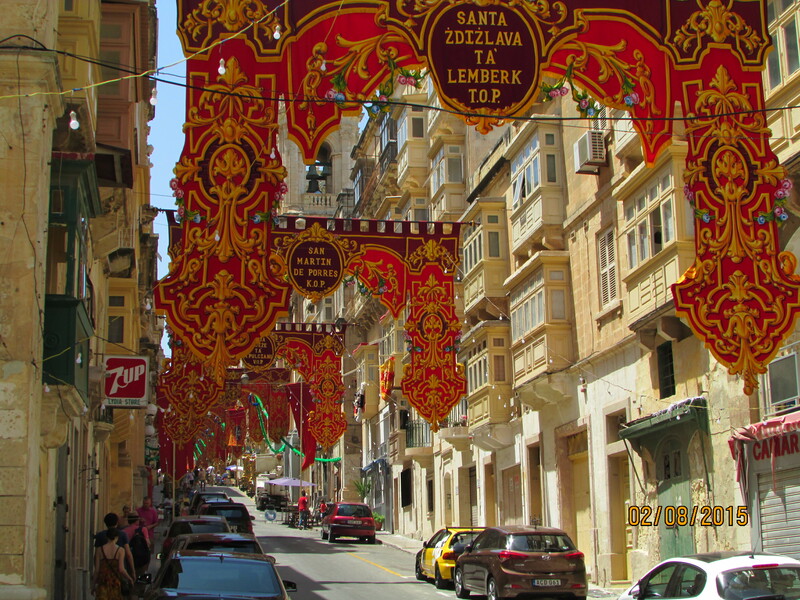 Valletta was interesting, busy and hot. More limestone flat roofed buildings, flags, cafes, gift shops. 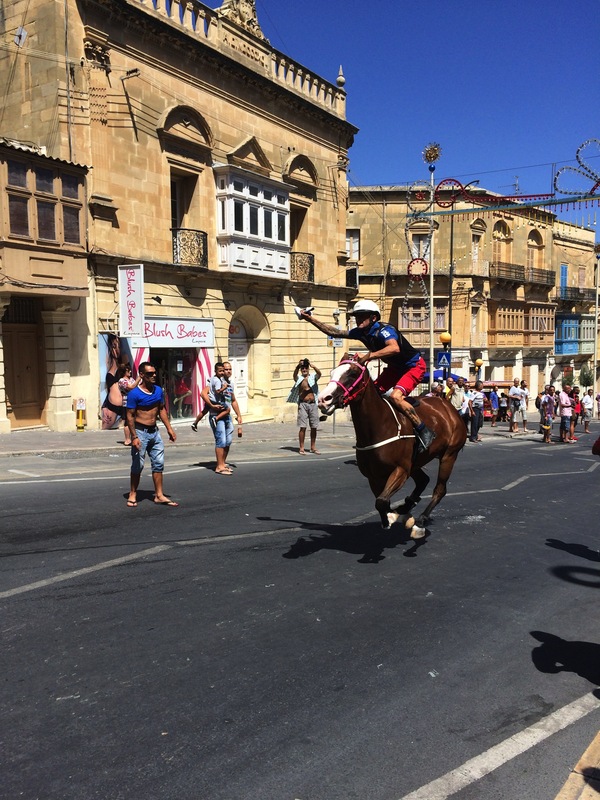 Malta has lots of Festa – each town has a Saint and one weekend each year they decorate the town, have a parade, let off fireworks and are generally festive. We looked round the free bits of the fort because the bits you pay for are basically museums and we don’t much like museums. Plus we could see lots just from the free bits. Great views. Loud canons at midday. All hot, so decided to go to Mac D’s for lunch. Got enticed into a cafe by man on the door. Had nice lunch in warm air conditioned dining room ( was less hot but not really cool.) Prices in menu differed from prices advertised outside but not by much ( worth always checking though!) Food nice and cheap. Toilets nasty. Service friendly. V rude American lady made a fuss because her margherita pizza had tomato sauce, not fresh tomatoes. When she left, waiter laughed and raised his hands! Went round the Grand Masters Palace. 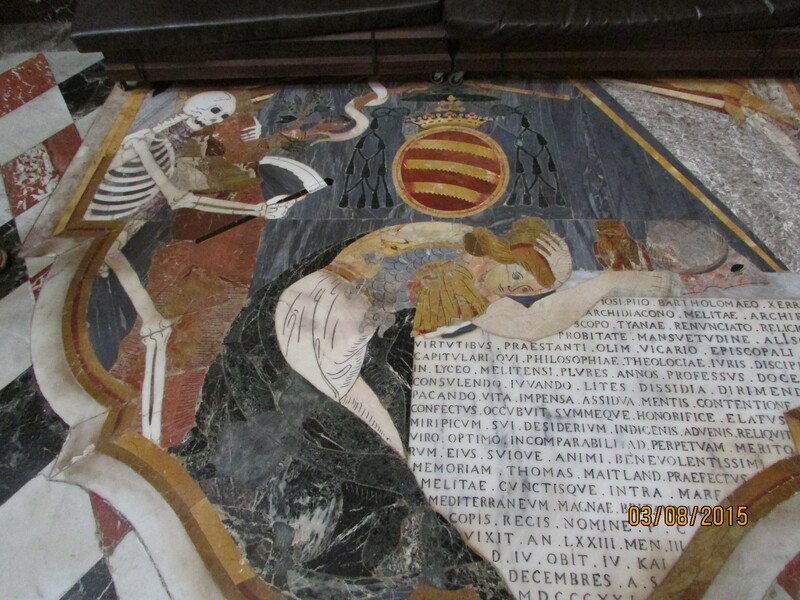 Cool painted ceilings and suits of armour. Lots of ‘Do Not Touch’ signs. 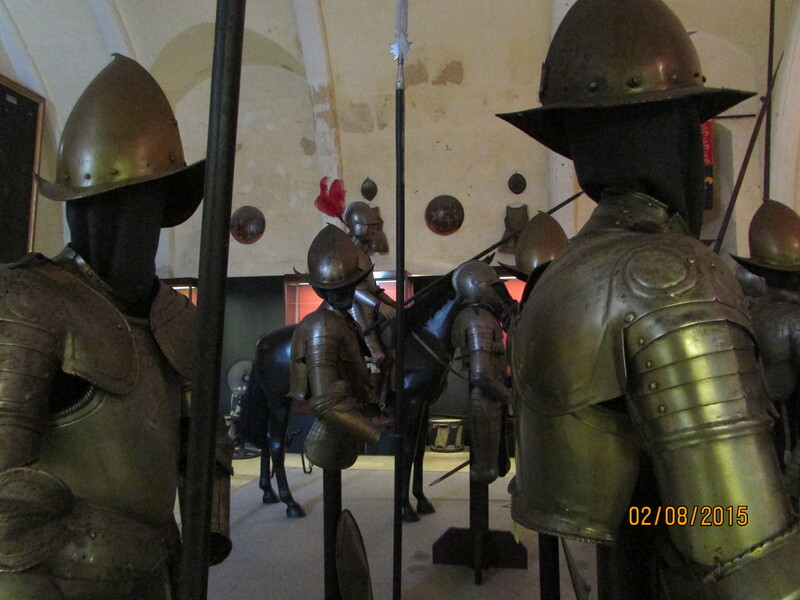 ( If you’re tempted to try on a helmet when no one is looking, don’t bother – they’re glued onto the modals.) Weapons room had lots of weapons ( not unexpectedly, you might think) and was very hot. Got bus back to St Julian. Friendly lady on bus told me that you can buy a weekly ticket for €21. Son 2 informed me his shoe ( just one) is too big so he was wearing three pairs of socks. Sounded both hot and high impact on the laundry front. Bought him a shoe insole. Walked to next bay and checked out restaurants. Everyone seemed very young and trendy ( am informed that the use of word “trendy” proves that I am old.) Ate ice creams next to sea. Walked around bay to Eat restaurant ( not part of the UK fast food chain.) V nice starter. R and I had cocktails which looked nice but mine was fairly low alcohol. Main courses okay but not great. When bill came, waitress said their credit card machine didn’t work. M ( the economist) informed me this was a scam. Either that or she was a bit daft to not tell us at the beginning as we may not have been carrying enough cash. Monday: Nice breakfast. Family communicated by mobiles again. Might take a book tomorrow. Drove to Mdina and Rabat. Mdina is the walled city within Rabat. Son 2 in charge of map again. Lorry ahead of us hit a tree branch which then fell and blocked the road. Son made up detour. 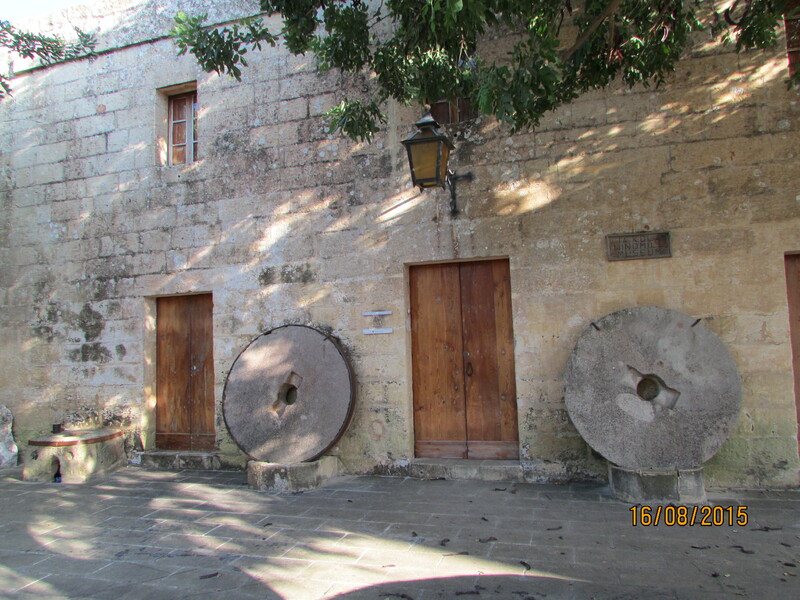 Arrived in Mdina, which was surprising as Son admitted that at no point was he sure which road we were on. Did not stop him making decisive decisions at every junction, we were fooled. Apart from M, who labelled him the ‘Helen Keller of map readers’. M requested that we not walk around in the midday sun. We arrived in Mdina at 11:50. It was hot. He hardly mentioned it at all. Walked to St Paul’s grotto in Rabat. It started to rain. Was only about five drops but all males complained. Fear we may be holidaying in Sahara next year. M complained that the name ‘Rabat’ is stolen from Morocco and St Pauls Cathedral is stolen from London. Walked around muttering about looking for the Maltese Eiffel tower and Statue of Liberty. We ignored him. 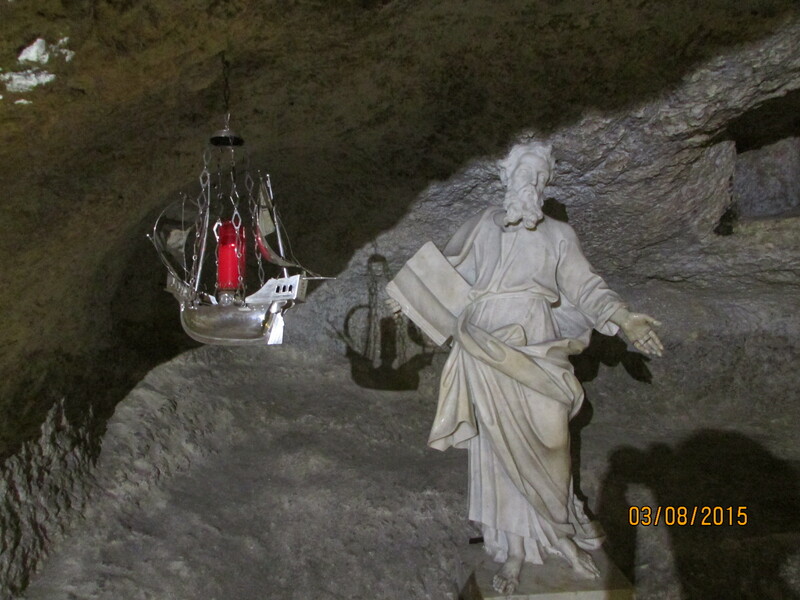 St Paul’s grotto was interesting, cool and dark, especially the catacombs. Not good if you don’t like confined spaces but excellent otherwise. Some of the best stuff is down narrow unmarked tunnels, so worth taking a boy with a clever phone or a torch. Tall males complain a lot. Used toilets in museum. Nasty. Toilets in Malta also rarely have paper, so worth carrying your own supply. Bought cushion cover for my collection. Has Maltese cross on it. Happy. 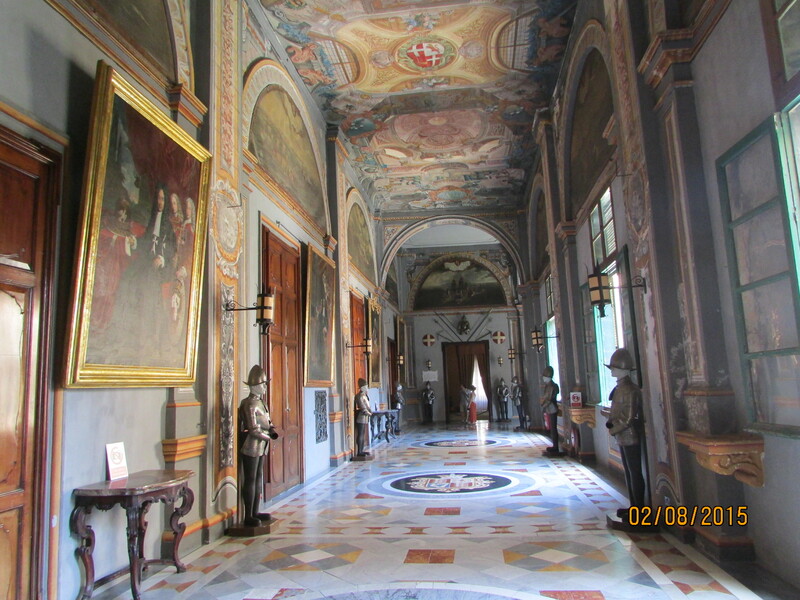 Ate lunch in Bottegin, Palazzo Xara in Rabat. Was okay and cheap. Drove home. Got thoroughly lost. R took over map reading and took us in a big circle past some bamboo. Fired her and reinstated Son 2/Helen Keller, who took us all around the coast. Was scenic if not exactly direct. Husband collected a plateful of Maltese food ( pickled herrings, pea pastries, cheese). Ate a few mouthfuls, then collected a plateful of English breakfast food to ‘dilute’ it with. Told him he’s getting portly. He did not appreciate feedback. Didn’t go to the Hypogeum in Paola as you have to book and there are no vacant slots for the next 20 years. 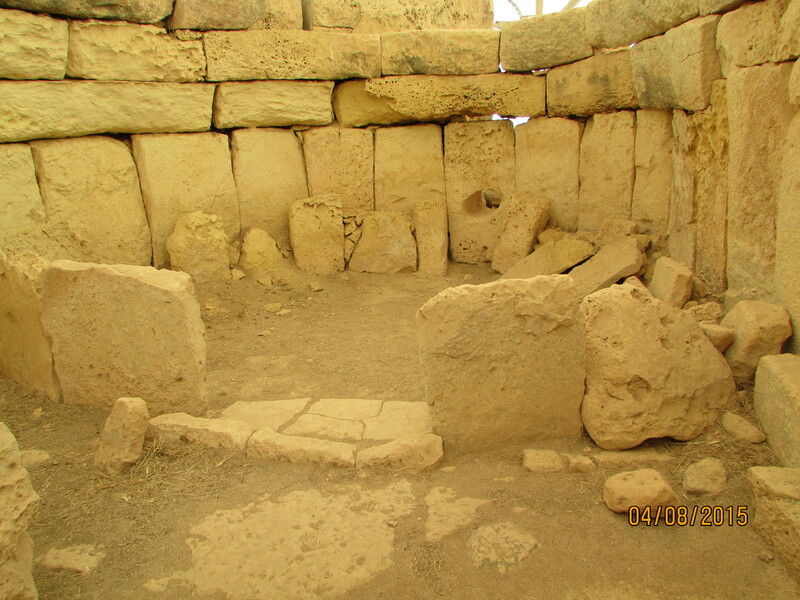 Drove to Hagar Qim to look at Mnajdra temples. Arrived 11:55. M again hardly mentioned “midday sun” at all. There was an interesting 4D film before the monument ( my kind of history, short, informative and no long boring information boards to read.) Temples were unusual. And hot. Drove back to St Julian with no detours. Son 2 told us, ” it helps if you know where you are when you start.” Explains a lot. Checked out and ate lunch in hotel lobby. Nice food. R said she needed to recharge all her electronics as her plug converters didn’t fit any of the sockets in her room. We pointed out that Malta has the same electricity as UK so she didn’t need any converters. R went quiet. Briefly. Drove to ferry at Cirkewwa. I cannot begin to tell you how my family pronounce the names here……. Arrived at ferry terminal in good time. They leave every 45 minutes, so only had to wait about 10 minutes but in the hot sun it felt like forever. 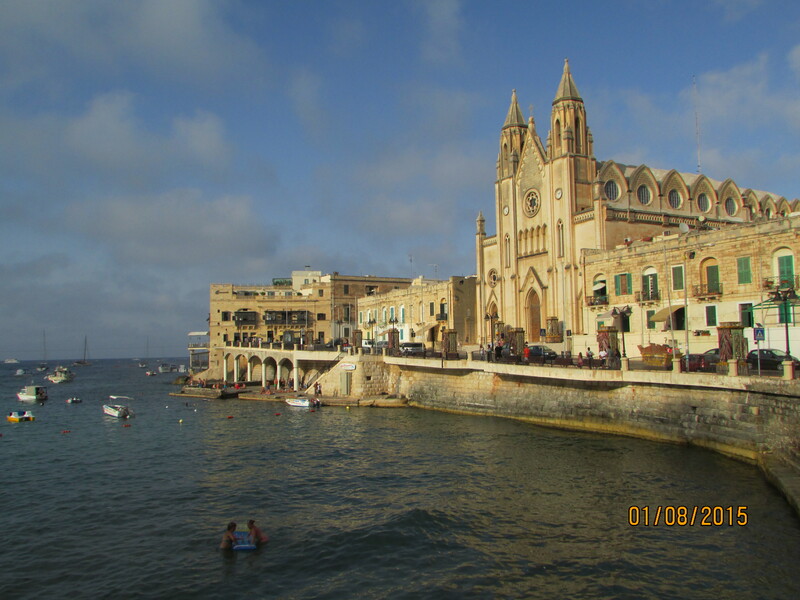 Was surprised by how big and near Gozo looked – like a peninsula across the bay. Son: Take the next right. R: This one, this one, turn right now. Husband: I’m not going up that one, it’s too narrow. Right, which way now? M:I thinks that’s wrong anyway. Son: It’s not wrong, I know where we are exactly. Probably. Okay, if there’s a roundabout take 3rd exit. But there wont be, roundabouts are only on the map, they never exist in real life here. Also hard to see ‘no entry’ signs as the sun has faded them all. 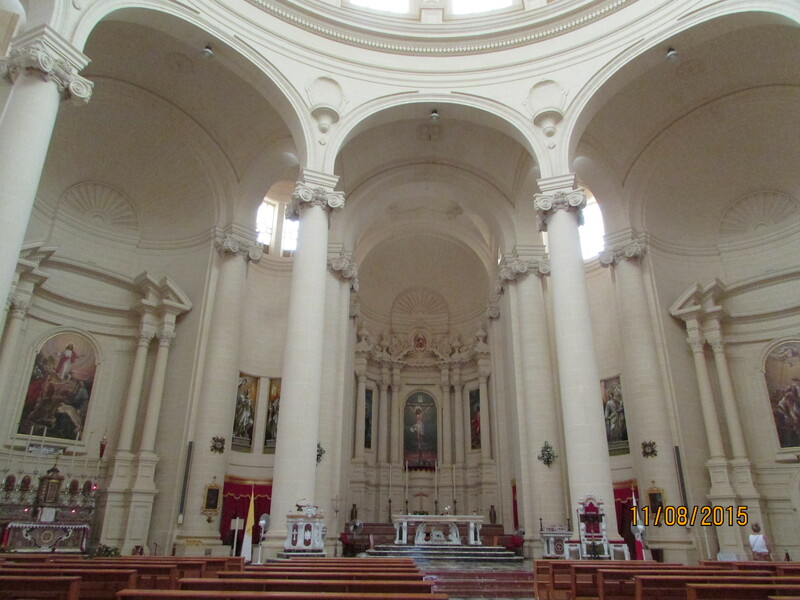 Gozo has more flat roofed houses and domed churches. Very pretty. Met villa man in square and went to villa. 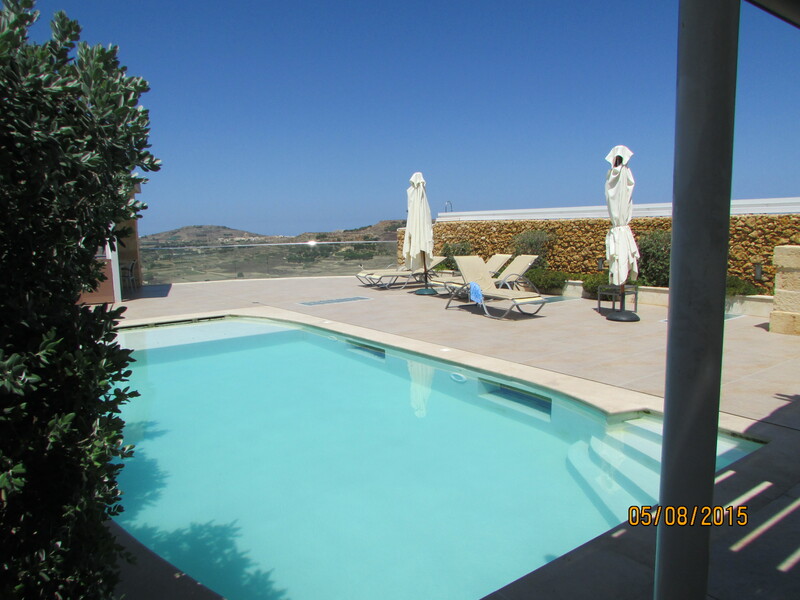 ‘Panorama‘ in Xaghra (pronounced ‘Shara’. My family never managed that.) We booked it through James Villas but it has its own website. Drove down winding road to nearest big supermarket. A Lidl. Very stressful. No brands I recognised, hard to find everything we needed, very limited choice. M noticed maggots all over eggs. Not good experience. Walked from villa into centre of Xaghra, about 10 minutes unless you got lost. Several people sitting outside chatting. Square has a few restaurants to choose from. We ate at Oleander. Very friendly and welcoming. Food nice, especially the baked brie starter served on figs and walnuts. Delicious. Husband and M raved over the tomato, capers, olives and peppers bruschetta. Son 2 agreed it was delicious ( and he doesn’t even like capers, olives or peppers. Isn’t very keen on bruschetta either.) All too full to eat our main courses. Had lemoncello shots then walked home. Didn’t get lost. Wednesday: Lazy day. Unpacked, did washing. Cooked pancakes and bacon – all takes ages in unfamiliar kitchen. Kitchen is beautiful but rather lacking in equipment. Used salad bowl to make batter. Only coffee maker seems to be a Nespresso machine ( but no capsules) or a cracked cafetiere which I don’t fancy using. Think maybe a dog mauled it at some point. Pool boy came. He was about 70. Boys found some toy boats and had races with them in indoor pool. So glad the sophistication of the villa has affected them. Got cinema room working, watched a mandarin dvd. Played ‘Game of Thrones’ board game. I still don’t understand the rules. Much testosterone fuelled arguing and making of alliances. Was a very long game. Lucky we weren’t in a beautiful villa with views across a valley full of sunshine. R hibernated somewhere. Wise girl. Of course, the best thing of all is that long after the game FINALLY ended, it could be discussed at length, each move analysed, much advice given. Shoot me someone. Strolled into town. Picturesque square/church rather spoiled by extensive building work. Found a small supermarket 5 minutes walk from villa. It sold everything that I had tried to find in Lidl, many with recognised brands. (I hate Lidl.) It opens at 6am, so ideal for buying stuff before breakfast. Ate at Oleander again. No one really enjoyed their meal. Maybe it’s just too hot to enjoy eating. Thursday: Lazed, swam, ice creams. The ice creams were like rocks so turned down the freezer to 1. Pizza for lunch. Tasted mainly of plastic. ( Lidl). Drive home was difficult, winding roads and lack of signs. Apparently they were designed to be confusing because the island was raided so many times. They succeeded. Ate in DVenue, another restaurant in the square. 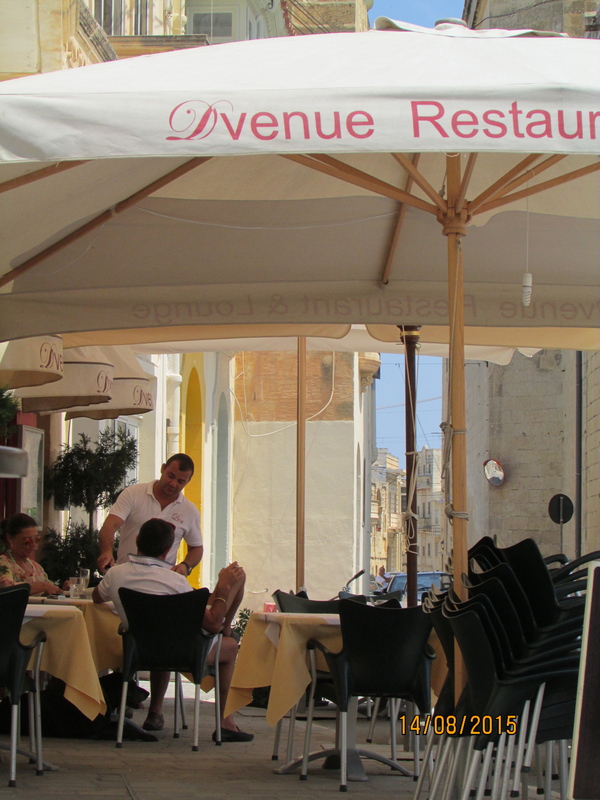 Actually, the best restaurant we found in Gozo.They had a good fresh fish platter. Nice meals. Walked back to villa and watched Harry Potter (not my choice) in cinema room. This is a long room built under the pool, so is dark and cool. 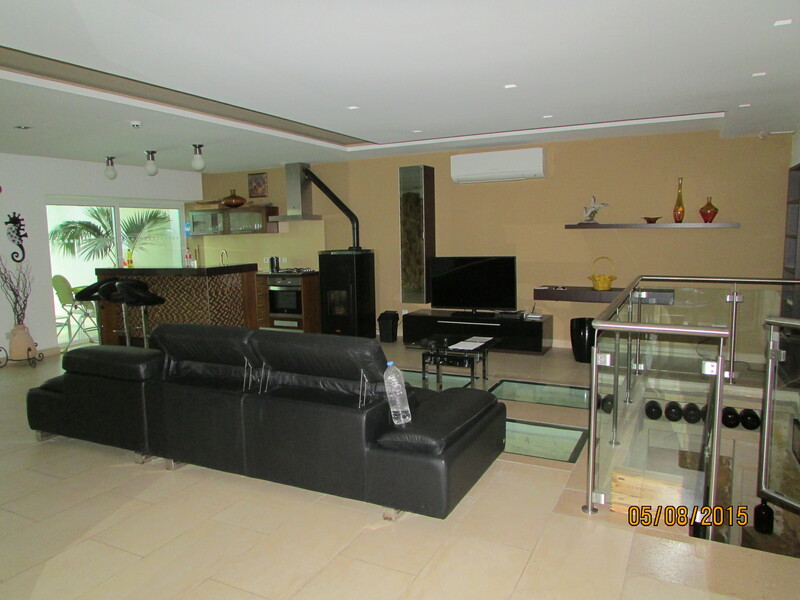 It has black leather sofas that recline and a big screen and sound system. Note to self: never allow husband to install a fancy sound system. He has it loud enough for the whole town to hear. Claims bass is set too high. Friday: Walked to local shop and bought local honey, eggs and milk. Made pancakes. There is also a bread van that comes from the local bakery and drives around the town honking its horn at about 10 every morning. Stops in various places. Nice crusty bread. After lunch, went for a drive. 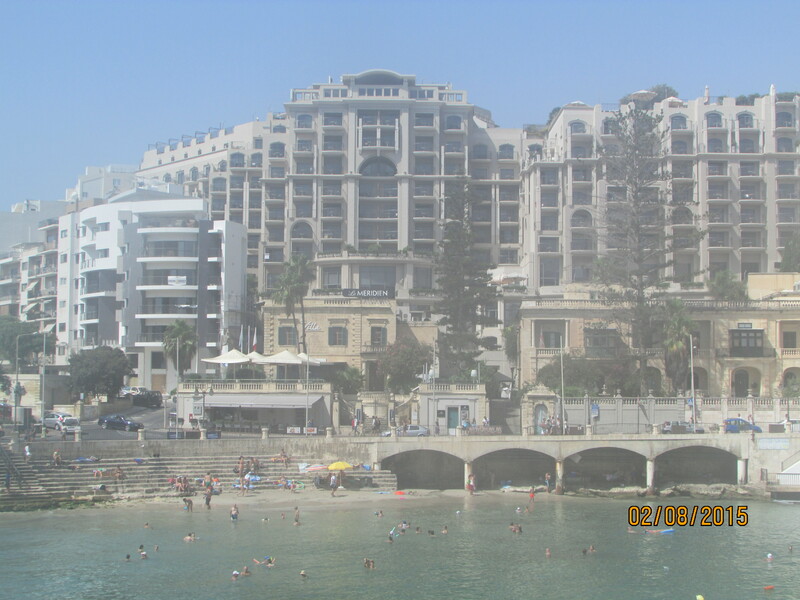 Drove to Dwejra Bay. Beautiful. Rocks down to deep blue water, Azure Window (a big hole in the rock which was very crowded with people taking photos), several ice cream vans, stalls selling tourist tat from Africa, St Anne’s chapel (more modern than expected.) You could look down onto the Inland Sea. This used to be a huge cave but the roof fell in, so now it’s a giant rock pool surrounded by cafes and full of boats for hire and divers. Took photos. Drove through St Lawrences. 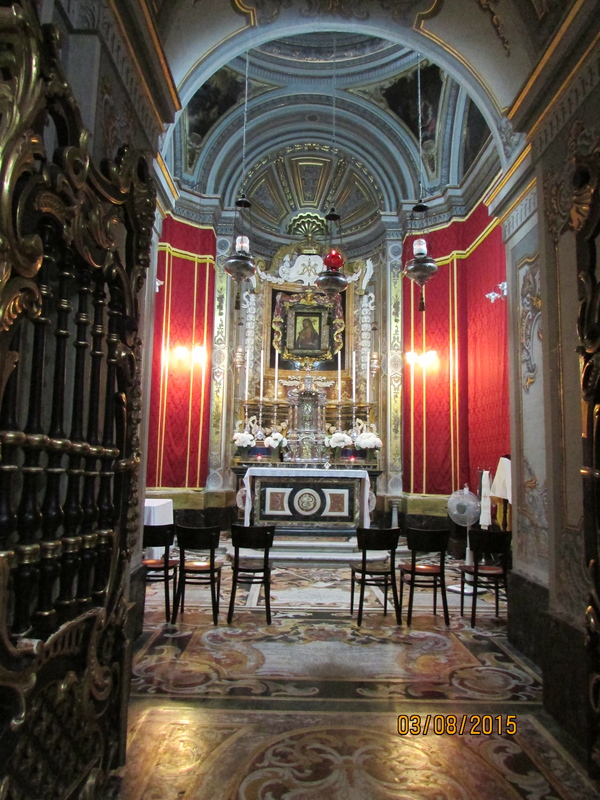 Took photo of church, which was very ornate, lots of red and gold. All the churches here have a basket of material next to the door, so you can cover your shoulders. 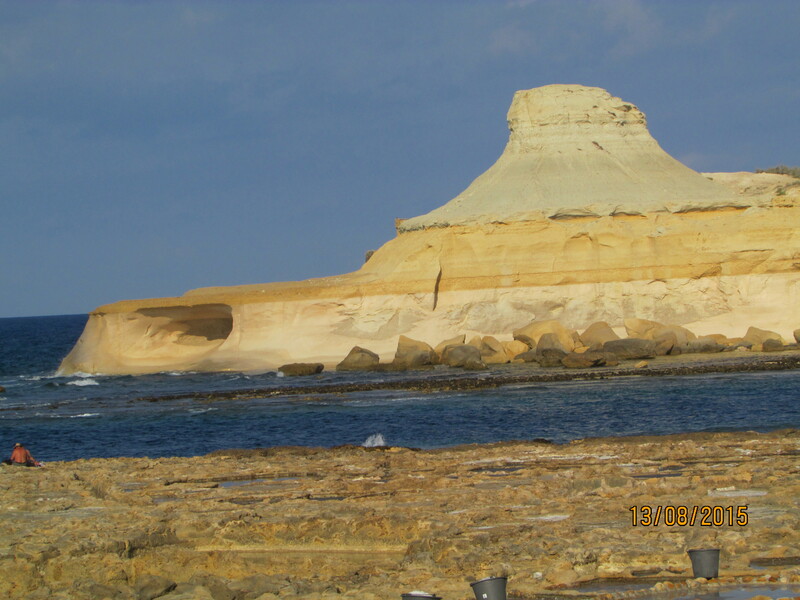 Drove back to Xaghra via Ghasri, Zebbug, Xwejni Bay, Marsalforn. You can imagine how my family pronounce these names. Saw interesting rock formations and salt pans but was told I had exceeded my photograph limit and the car was not stopping. Getting into Xaghra a challenge due to closed roads but no helpful diversion signs. 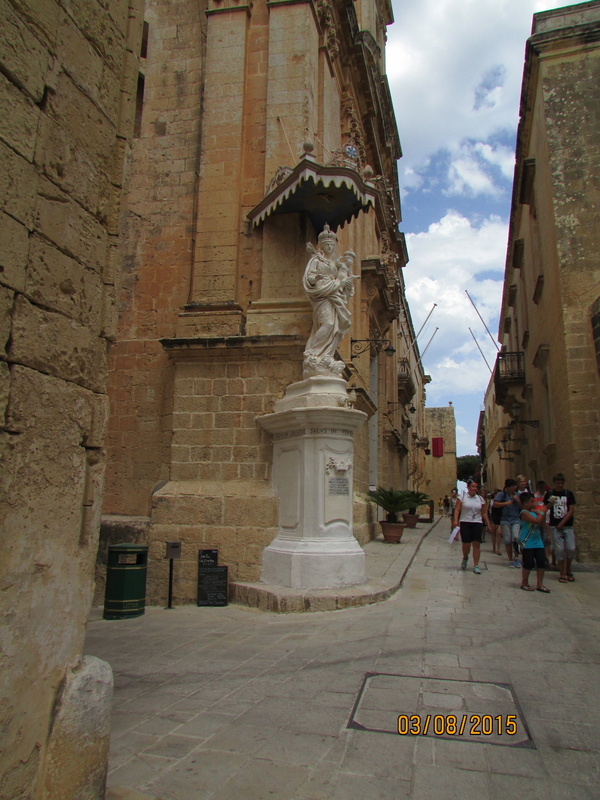 Also, Gozo DOES have cul de sac/no-through-road signs, because I have seen some. However it obviously did not buy enough because mostly they are unmarked and you just have to turn round when you get to the end. Ate several ice creams. Still not losing weight. Played Game of Thrones with the males. Husbands turns are like advert breaks in the US – you can write diary, read a book, cook a three course meal and still not miss any play. Boys had coded talks to discuss the rules in secret (like I would’ve cared.) R sunbathed and talked to the boyfriend. Ate at DVenue again. Finished with complimentary lemoncello shots. Weekends get busier, so we booked a table for Sunday. Saturday: Quick breakfast, then drove back to Dwejra Bay. Worried about hair being dry so put suncream in it. R asked me why my hair was blue. Walked down some steep steps from the first car park to a cove where Fungus Rock is ( big rock where they used to collect a plant. Which apparently was not a fungus.) Water wonderfully deep, you could just float around wearing a snorkel, lost in an underwater world. The route into the water was via sharp rocks, so we wore swimming shoes ( bought for about £5 from Amazon before we came and they worked really well.) Saw rocks and seaweed and shoals of fish. Son 2 asked me if I knew my hair was blue. Bacon and egg lunch at villa. Males then discussed/argued about (for hours) the refraction index of water. M used breadsticks to illustrate. Argument somewhat weakened when breadstick went in his eye. Played G of T. Each move took 27 hours. Watched Pitch Perfect in cinema room. Still not my choice but not as bad as you might think. Cooked steaks (horrible) and had them with red wine (nice) and salad (okay) in fancy dining room/wine cellar which has been carved out of the rock below the villa. Very atmospheric. Sunday : Made pancake batter then couldn’t light hob. No gas. Annoying. Husband checked barbecue outside and managed to light it. Took ages to heat up but then worked fine. Was rather lovely to eat breakfast outside, overlooking the valley. Sent text to villa man who changed gas bottle later that morning. There is a small dog who wanders along the ridge and peers at us. Doesn’t seem to understand French or Mandarin. Everyone has given him a different name. Had cold shower. I have problems with the taps here. You sort of have to push them up to turn on then wiggle them left to get warm water. Sometimes works, sometimes doesn’t. No one else has this problem so it must be me. Walked to church. Service was in progress but other people were going in so I slipped into the back. Was incredibly hot in there. Very full church, lots of families. No order of service sheet or hymn books or Bibles. 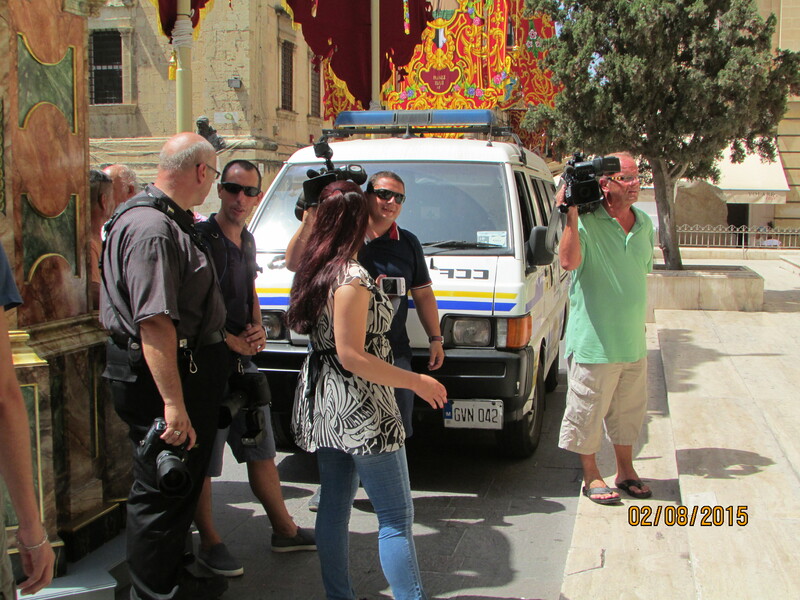 Service all in Maltese, was like listening to Arabic, couldn’t understand anything. After 10 minutes, with sweat trickling down my back, I gave up and slipped out again. I’m glad I went – I don’t know how else to make Sundays different – but there seemed little point in staying long. Pretty church though, painted ceilings. Husband went to cake shop, Cafe Reale. There is an Italian man who owns it. He gets up early every morning and bakes wonderful cakes. We tried a selection. Played G of T. Each move took 29 hours. Clearly one major difference between the genders is that females can decide future moves DURING someone else’s turn, hence taking much less time when it’s time for their move. Plus they don’t actually care that much. R had washing machine disaster. Now has lots of clothes that match her yellow sundress. Boys played her lots of songs with the word “yellow” in. I’m sure they were trying to make her feel better. Saw a blue light on a roof. Told R they have blue stars in Gozo. Monday : Husband went to buy water and milk. Hard to find full fat milk here. Today bought 2.5% fat. I think the darker the blue of the carton, the higher the fat content. But not necessarily. Discussed family chores as husband has decided everyone should help (that idea went so well last holiday.) R and M responsible for all dishwasher duties. They immediately formed a trade union and appointed R as spokesperson. Spent some time discussing terms and conditions with husband, who tried to instigate penalty clauses but R told him it contravened European law. So glad he started this. Son 2 (in charge of rubbish disposal) kept offering to strike in support of R and M.
After lunch walked to square. Full of dusty roadworks, so continued round the corner to a little cafe. Had ice creams and coffee. 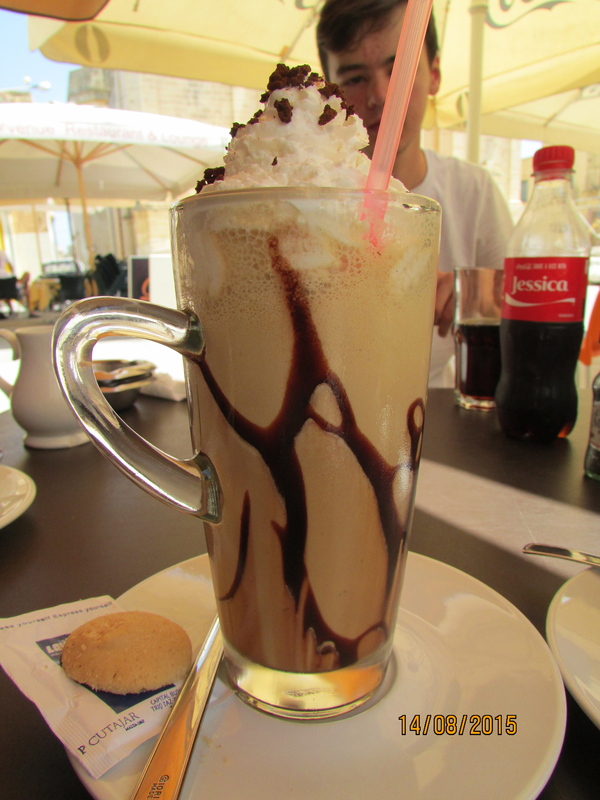 ( I had Malteaser ice cream – clearly from Malta.) Hot walk back to villa. Went to Victoria as R wanted to buy gifts (yaay shopping, my favourite.) Very windy. Told a storm was coming, 110 lightening strikes in Tunisia, apparently. Shops all rushing to get their displays inside. We went to Maldonado Bistro. They didn’t open until 7pm but kindly let us go in early and have drinks while we waited. Son 2 used his clever phone to translate the menu from English into Maltese and Mandarin. Helpful. The menu had 12 different bruschettas. This kept family occupied for 50 minutes (just the choosing bit. You may have not noticed but my family enjoys negotiating/discussing/persuading. Strong opinions. Not my genes.) R tried a kinnie, which is advertised everywhere here. It’s a bitter orange drink. Very bitter. Drove home. Streets pretty at night. Saw several blue lights on poles. Boys told R it was an alien invasion. Tuesday: Son 2 complained he had not slept due to M being in charge of air conditioning. He said it was practically snowing in their room and he might have pneumonia. Saw the third biggest dome in Europe ( except one in Malta also claims this. One is higher and one is wider, so there is some dispute. Sounds like my family.) The rotunda is nice, quite simple inside ( apart from the massive dome). It was built over a smaller, more ornate church, which they moved to the side by numbering all the stones and moving them individually. It is now a side chapel. 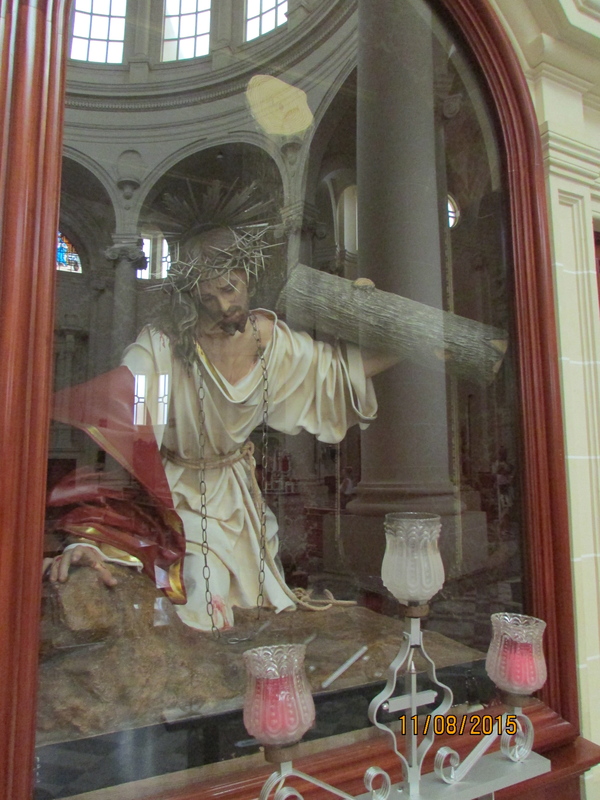 The main church has some good modern art, including two statues made of papier-maché by Alfred Camilleri Cauchi. I like papier-maché, made a rather fine mask when I was at Junior School. Not that it really compares. Went to small supermarket next to rotunda (husband has developed a peach addiction) started to absolutely pour with rain, ran to car, soaked. Drove home through Victoria, which is like the moving staircases in Hogwarts in Harry Potter books – whichever way you go in you can never find the correct route out. Cleaners at villa. Were very thorough, even found two towels husband had hidden in wardrobe in attempt to get extras. J asked them for blankets. Males decided they wanted to build sandcastles on Ramla beach. Found males in far corner of beach building Venice. Drove home. Swam. Pool very cold when full of rainwater. Ate ice creams, which are still too hard. Realised the “fast freeze” button had been left on by previous guests. Wednesday: After breakfast, drove to Victoria. Walked to citadel. Great views, could see all around island. 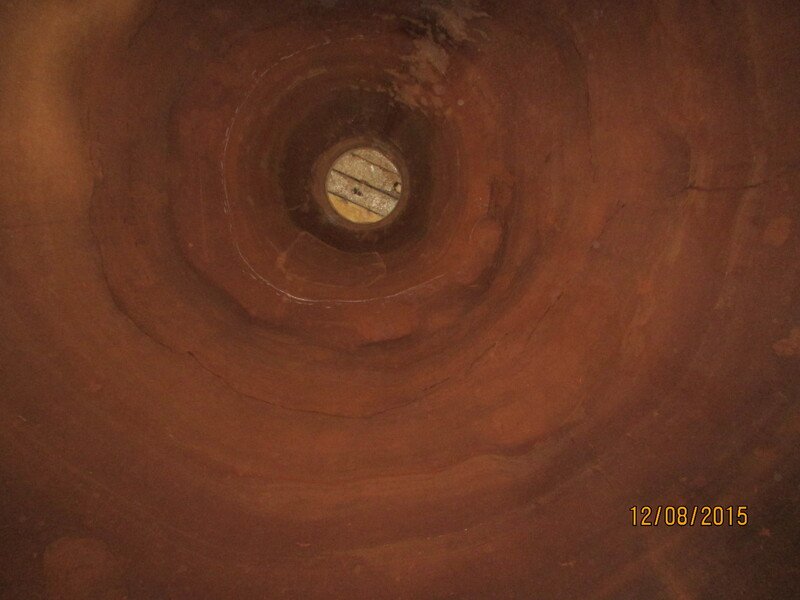 Went into the battery, which led to the silos (huge grain storage areas, like great caves.) Very interesting. The silos are connected by a dark narrow tunnel (from when they were turned into a reservoir) so now you can walk right into them. Son 2 and R sang a chant, harmonising with their echoes. Was magical. Then saw the rooms used as WW2 shelters. They were under the reservoirs, so if they’d been hit, everyone would’ve drowned. Not such a good idea. Didn’t pay for the museum. Didn’t pay for the prison, but did put Son2 into the stocks outside. Didn’t see a Christmas tree ornament to buy. But did see some traditional lace. Shop owner said it was the last of her stock as all her suppliers were now in their eighties and younger women wont sell their work because it earns about 50p an hour. Seemed too mean to buy any. Had lunch back in Xaghra at Cafe Reale. They have the BEST iced coffee. Still not losing weight. Males decided to return to beach, we stayed here to swim but then the pool man arrived so we couldn’t. Annoying. Males returned late, very happy, had built a brilliant castle and had been joined by another family (somewhat younger, so they could pretend they were building it for the children.) Also helped by ‘Steve the tiler’ from Australia who had used his building skills to good effect. M had heaved heavy boulders to protect it, Son 2 had applied a more scientific approach and incorporated some thatch to increase structural support. M rather disparaging of the thatch. It was slightly surprising how long three adult males could discuss a sandcastle for. Husband did suggest a post dinner drive to show me and R but unfortunately drank too much Cisk and was over the alcohol limit. Such a shame. Nice dinner again at DVenue. Every Wednesday evening at 9pm in July and August a drama group performs in the square. It has an excellent sound system but I suspect the performance appeals mostly to their family members. Afterwards the choirboys played football using the church doorway as a goal. Excellent use of space. Looked across the valley. All the towns are now full of blue lights on poles. Apparently they represent Mary ( not aliens) and I assume are ready for the 15th, which is Assumption Day. 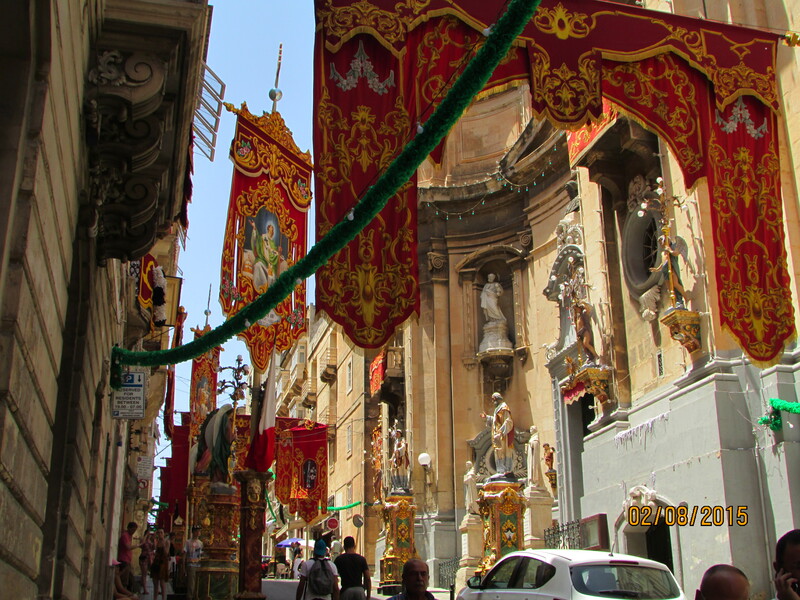 There is a strong Catholic presence in Malta. 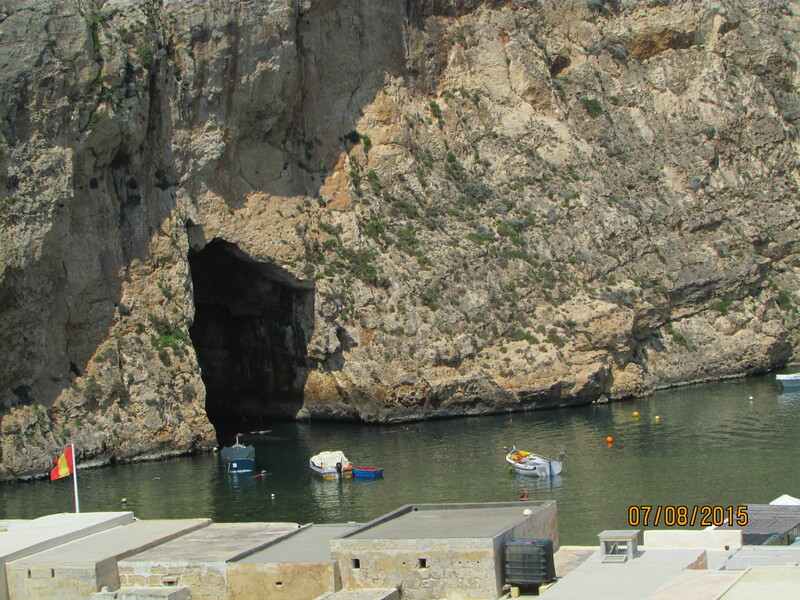 Thursday : Husband booked a boat for Friday afternoon, Xlendi Watersports, €80, 4 adults, 2 hours. Drove to Calypso’s cave. This is where Ulysses was put under a spell by the witch Calypso when returning from the Trojan war (if you enjoy Homer.) It was confusing to find on maps as there’s also a viewpoint and you can’t tell which is on the road. Followed signs. There was a small boutique where an elderly lady (possibly Calypso) was selling clothes. Followed signs along a walkway. 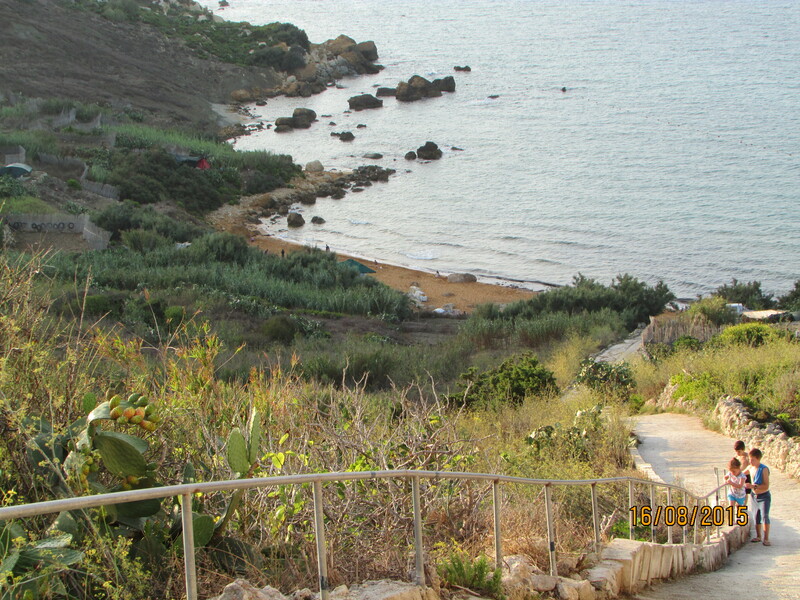 Brilliant view of Ramla beach and out to sea. No cave. Searched around a bit (while husband checked sandcastle with zoom on camera). Found some disused steps and some scaffolding holding up a rock. I think Calypso’s cave has collapsed. This is a pity as it’s in all the guide books and sounded interesting, perhaps they will repair it. Went back to square for more iced coffee with cream at Cafe Reale. Watched building work and cars narrowly missing each other. 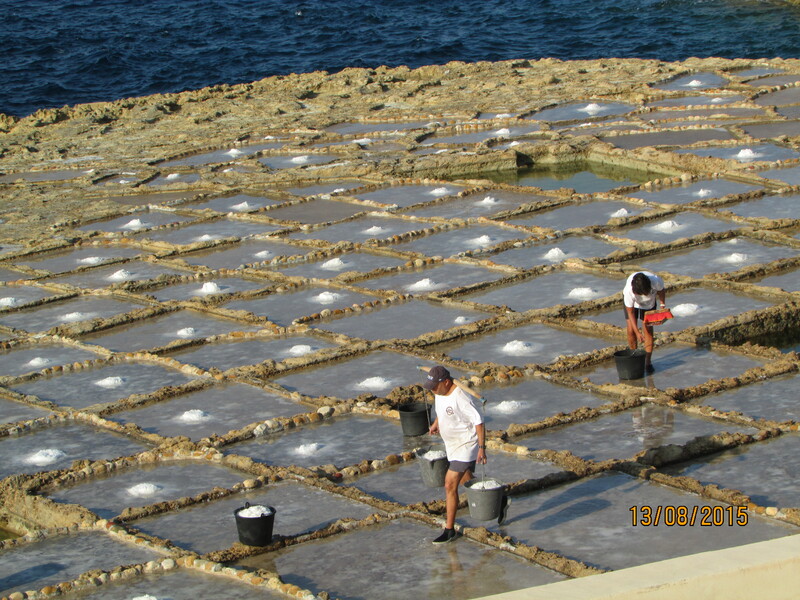 I must say, Gozo has a LOT of building work, they seem to be rebuilding the whole island. Back to villa in time for 12 noonish canons. 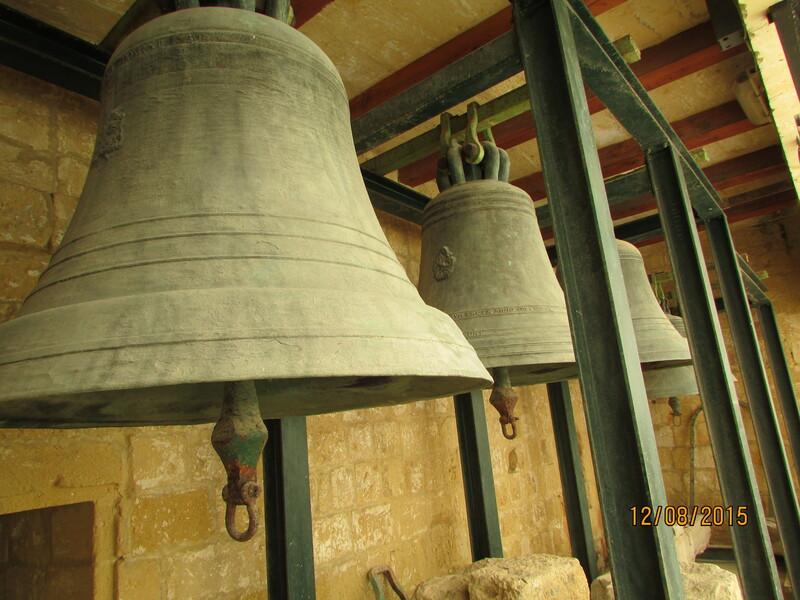 Gozo also has a lot of canons. Walked around Qolla-L-Bajda. Weird rock erosion and a cave. White clay cliffs eroding fast, beach littered with great chunks of fallen cliff. Cove interesting but a bit smelly. Evening meal in Marsalforn. Ate in Menqa L’Antika, which had good reviews but either we were unlucky and went on a day when they had staffing problems or they wrote them themselves. Good menu but food didn’t really match descriptions. Friday: Did shopping for weekend as everywhere will be shut for the public holiday. Planned to swim but pool man came. Again. I have never stayed at a villa that has QUITE so many people arriving. They seem to come every other day. Walked to Cafe Reale for coffee and cakes. Bought take-out pizzas for lunch. Family then left to go boating. I don’t much like boats so elected to stay home and read/swim. They said all worked well. Husband had prebooked the boat by phone and they found the office easily. The man spent a long time explaining where the hidden rocks were and marking them onto a map. He took a credit card number as security and then they left. Husband passed map of rocks to Son 2, who put it safely onto wet seat next to him and then watched in horror as the wind carried it away and into the sea. R said there were a few calm discussions where everyone was very understanding and then they continued. All they could remember was the worst rocks were marked by a yellow buoy, so they gave all yellow buoys a wide birth. They returned unscathed, no one drowned and they made up some best-seller songs about being in a speed boat driven by an accountant. Ate in DVenue. Very nice. Again. Saturday: Today was the day of the festa in Victoria. It was surprisingly hard to find out details/timings but found them eventually, gozonews.com is a good source of information. Decided to go to the 2:30 horse racing. It began at 2:10, which was a surprise. 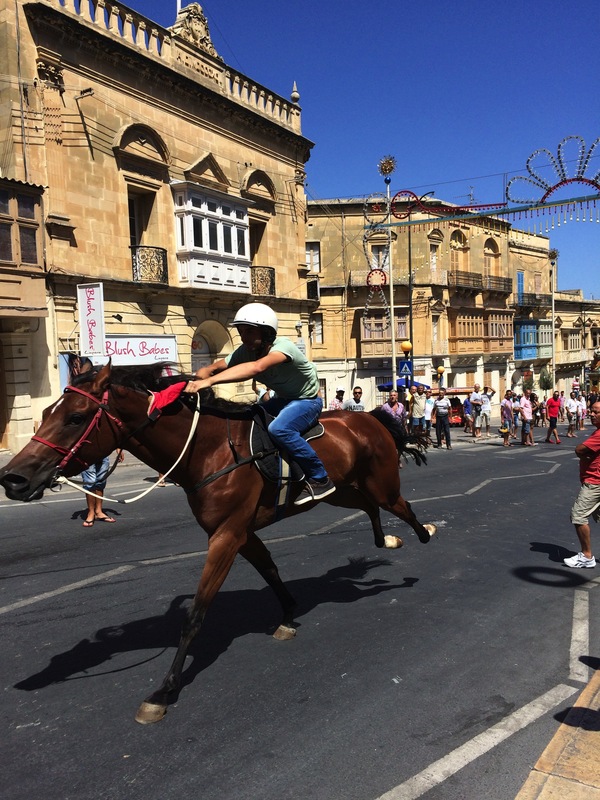 So was the number of people wandering the crowded streets seconds before the first horses came galloping down. 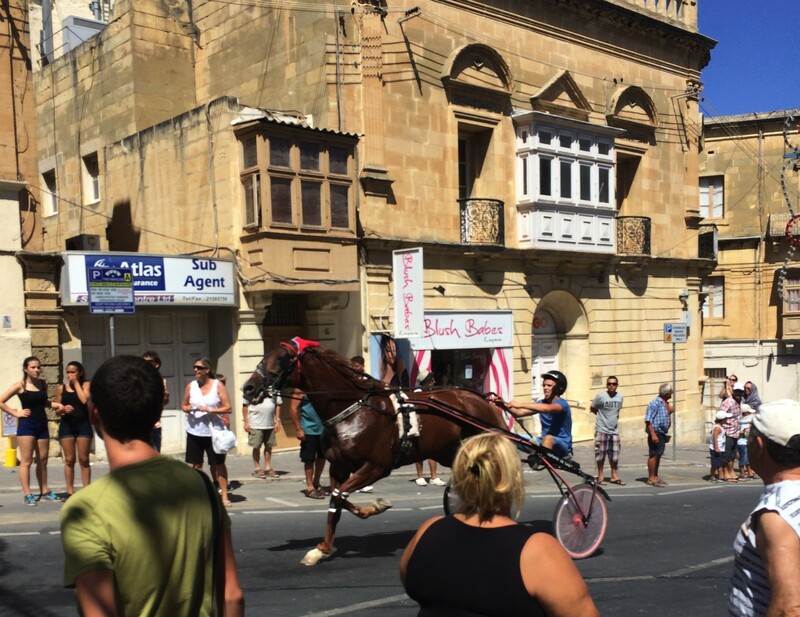 Most races were horse and carts, like Roman chariot races, three in each race, down the main street in Victoria. There was a ten minute pause between each race, which feels a long time to wait in the hot sun. In the evening were fireworks, which we watched from the villa across the valley. Sunday: Today R had to go home (only 2 weeks off work.) 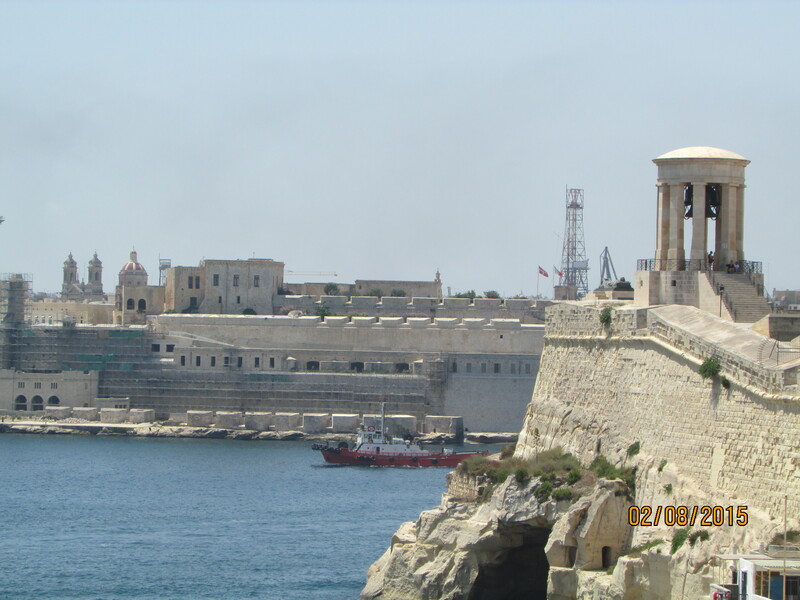 We took her back to the airport in Malta, felt strange going back, the roads are much busier. All the timings with ferries worked well and it was a three hour round trip. You only pay for car ferry when returning to Malta, not on the way out, €15 for a car plus €5 for each passenger. When we got back to villa, Son 2 had already moved into her room. Said it’s less Arctic than sharing with M.
Omelette lunch, then watched Arsenal/Palace match on tele. Went to windmill in Xaghra. Used to be a ‘community windmill’, when the wind was blowing in the right direction they blew through a shell to let the town know and everyone brought their grain to be ground. It was shut, had no sails but looked worth a visit another time. Drove to look at some viewpoints on the North side of the island. Roads were too small, unfinished, basically footpaths, so we changed the plan. Went to San Blas Bay. Very steep walk down, though an enterprising local did run a taxi service to the beach for anyone who didn’t want to walk. Walked past some interesting small agriculture growing in derelict buildings, was like a Hobbit village. Amazing viiews. Saw figs, prickly pear, grapes, lemons. Beach was small and sandy. Ate in DVenue – never disappoints. Strange not to have R with us. M gave Son 2 and husband some advice: “Conversations work best if you take turns at speaking rather than talking loudly at the same time.” I’m not sure they heard him. Didn’t go to church this week. The day was nice but it didn’t feel special, different. Didn’t feel like Sunday. 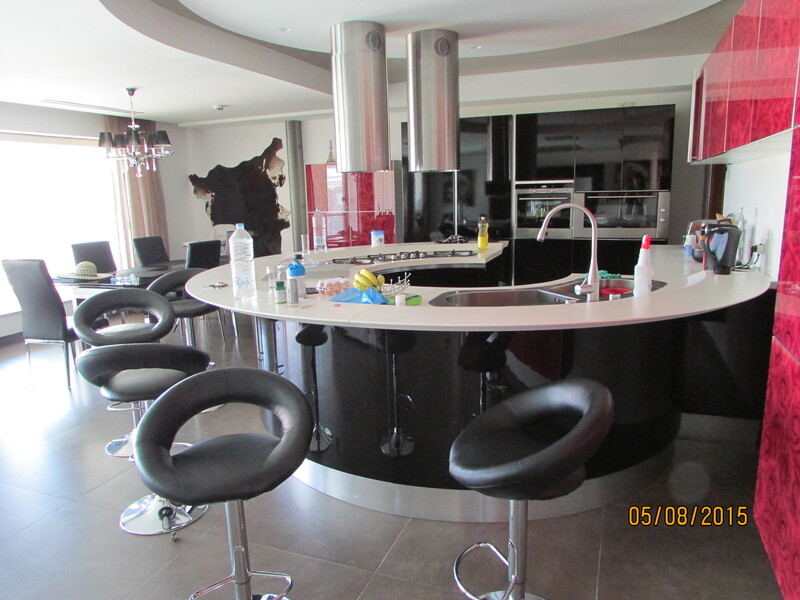 Monday: Big breakfast – lots of food in fridge to be eaten. Went back to Dwejra. Had a boat trip. 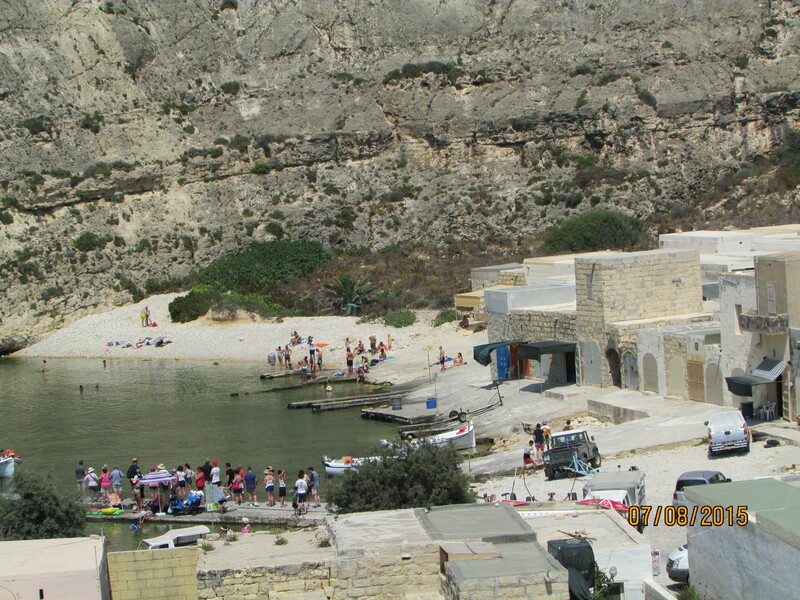 You get the boats from the little Inland Sea, €4 per person, takes 15 minutes. We went through a narrow passage in the rocks towards open sea. One woman got scared by the waves and deep water, so the boatman returned her to shore. 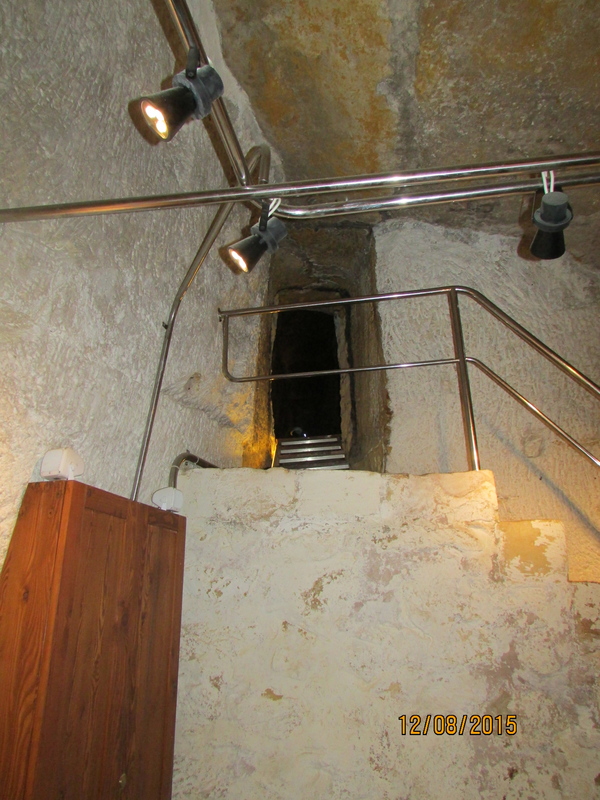 She was apologetic and embarrassed but we were pleased- meant we got to enter the cool dark narrow bit twice for free. Mr Boatman pointed out deep blue water ( it looked dyed) cool orange coral, caves, interesting rock formations. Excellent trip, not expensive and short enough for me to not get bored. Found Blue Hole, which looks a lot bigger in guidebook photos. Saw Qawra Tower which the Knights built to guard Fungus Rock but car refused to stop at best photo stop on the hill. Went into the glass shop which had some surprisingly beautiful glass. 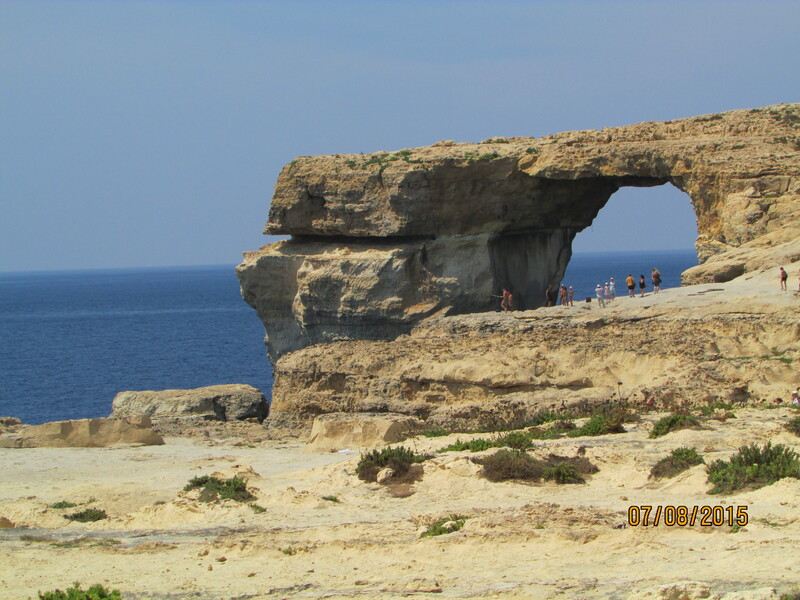 I like Dwejra, it’s busy, interesting and there are some really cool natural features. Scratchy rocks really mess up leather shoes though. 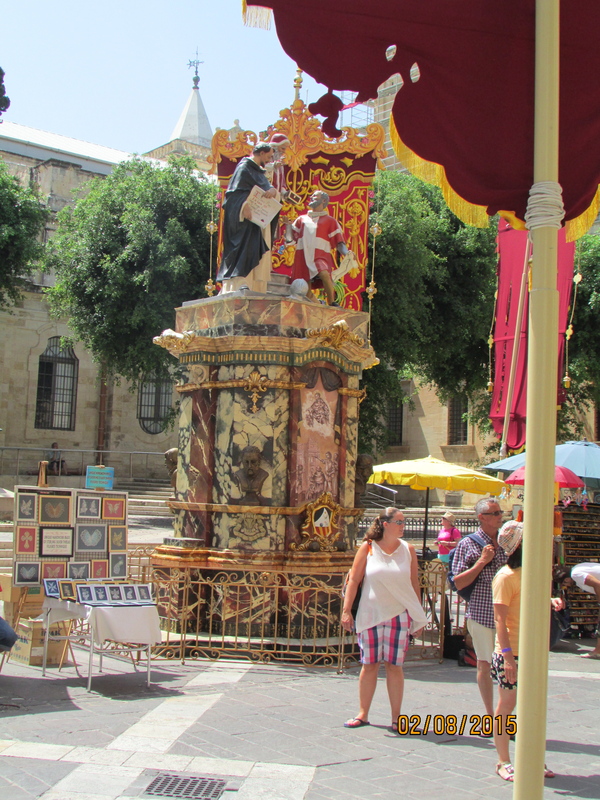 Came home via the craft village in Gharb. Males all pleased and excited when I suggested this and I didn’t feel hurried at all. Several small cabins housed various leather goods, various arts, lace and local food products that you could taste. Bought some fig jam for the mothers. I like Gozo. It’s surprisingly empty but has a good range of restaurants and cafes. It has some pretty towns ( I think St Lawrence is the prettiest) and some spectacular scenery. Plus, the signs and menus are all in English and the weather is hot. I hope to visit again one day.